The rousing cheers. . . the marching bands. . . the pep rallies . . . the tailgate parties . . . the proud display of your school colors. 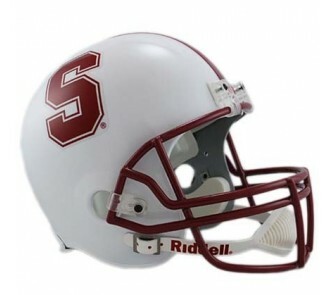 Support your alma mater with a Stanford Cardinal NCAA Replica Helmet that you can treasure for now and years to come. Each helmet is an officially licensed collegiate product, complete with authentic team colors and decals. Perfect for display in your home or office or as a gift for fellow alumni. [...] was able to get it signed by the 2011 Stanford football team after their Spring practice game at Kezar Stadium 2 Saturdays ago... 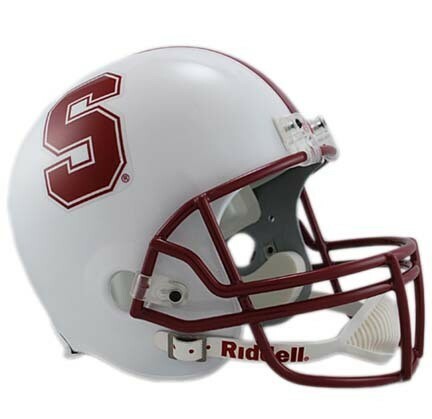 Your product was very nice - the players sat their game-worn helmets on autograph tables next to them and your replica helmet looked exactly like theirs, down to the shade of red, the stripe down the middle and the 'S' emblem. Based on this experience, I will certainly consider OnlineSports for football helmets in the future! Thanks so much!